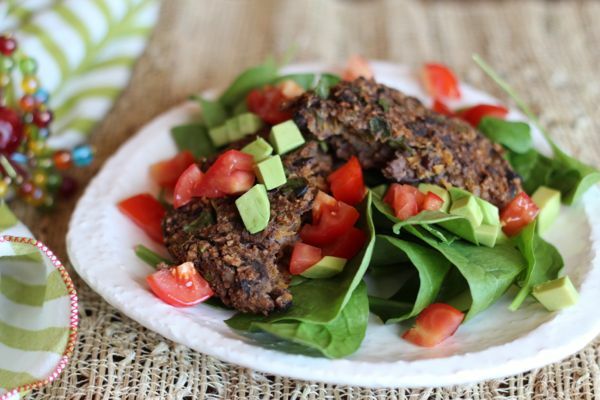 A flavor packed and fiber filled veggie-based burger featuring the nutritious rock star, the black bean. After experimenting with a few veggie burger recipes in my attempt to eat more plant-based meals, I realized that a black bean base really does yield more depth and texture. Serve these topped with guacamole alongside sweet potato fries for a delicious meal! As pictured here I like them on top of a bed of spinach with chopped tomatoes and chopped avocado. They are hearty and filling and great for a weeknight meal. Leftovers for lunches are an added bonus! The high quantity of protein and fiber in black beans helps to move food through the stomach to the large intestine at a healthier pace supporting a healthy digestive system. This high fiber content also helps to curb hunger cravings. Black beans have the highest levels of antioxidants of all of the common beans, as much as the antioxidant-rich cranberry. They are also rich in minerals. Preheat the oven to 375* and heat the oil in a medium pan on medium heat. Add the onions and garlic to the oil and cook stirring until onions are soft and translucent, about 4 minutes. Stir in the cumin, coriander, slat and pepper and toss until fragrant. Add the mushrooms, carrots, Tabasco and orange juice. Lower the heat and cover, stirring every now and then until tender, about 6 minutes. While the vegetables are cooking, grind the chips in a food processor until they reach the consistency of coarse crumbs. Place the black beans in a medium bowl and mash with a potato masher. Add the chip crumbs, egg and cooked vegetable mixture and stir well until blended. Form the black bean mixture into patties using your hands and place on a parchment lined baking sheet. Bake for 20-25 minutes until firm and have a very light crust.